Contact us if you have a story to share! Two months ago today Carlton came into our home and what a blessing he is. 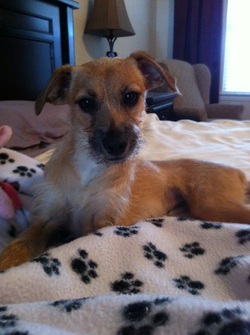 Carlton is doing very well and getting along wonderfully with Jolie / Liza and Presley. He has become my jogging buddy and he really enjoys it. I also like the fact that I have someone to jog with me. 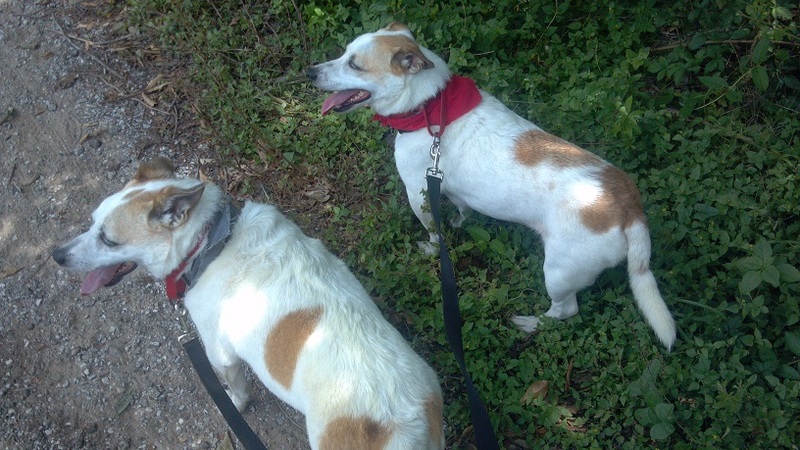 Jolie and Presley love to walk but they are not into jogging, so it works out perfect for all of us. Carlton and Jolie send a great big hug to you and everyone involved with N.A.B.S. Had it not been for you all, we would not have these sweet babies and I can’t imagine being without them. Roman is really handsome. 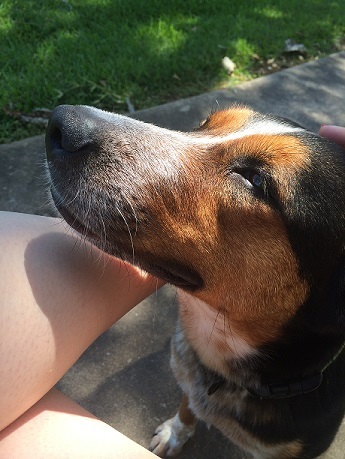 When I walk him, people stop me to tell me how beautiful he is. They always comment on his shiny coat. Roman and Mojito are getting along really well. Sometimes they share Roman's dog bed. Mojito is a bed hog. Roman ate some of his dog food yesterday and he ate some more today. We talked at the recent Alvin Lodge Car Show and I mentioned my son’s family having bought “Zoe” from Noah’s Ark. Zoe definitely found a good home. She’s loved, treated like a Queen, and even has a special friend now named “Willie” (a Labradoodle) that she visits often. 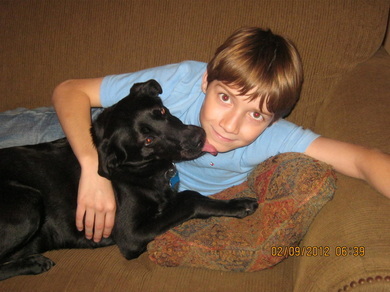 Caleb Starkey, Zoe’s young master, truly loves her. I enjoy seeing her lie near him while he plays. I wish all dogs could be so fortunate as to find such loving homes. I hope you enjoy the photos that are attached. 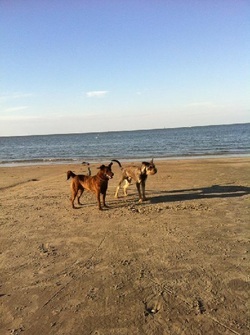 I enjoyed receiving the email updates and seeing the fur babies so happy. then realized it’s been a while since I sent you an update on Jolie (Liza). She is doing very well. Sitting out on the back patio late in the afternoon with me and my husband is one of her favorite things to do. We sit side by side and enjoy the gulf breeze. Jolie is very vocal, she actually tries to talk to us. I have her on video and everyone gets a kick out of listening to her. As you can see in the photo she has grown a lot of hair since we adopted her in 2012. I can’t tell you what a blessing she has been to this family and especially to my husband. 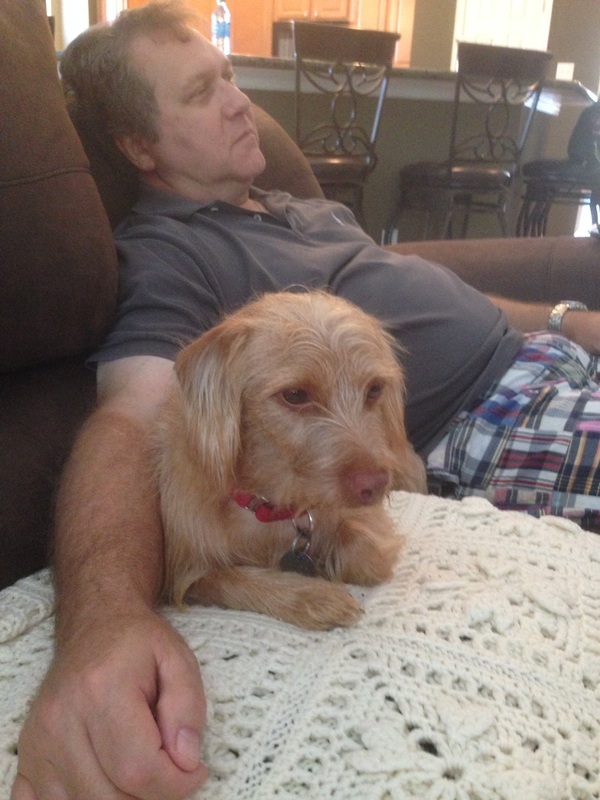 He lost his father on 4/7/12 and when he saw Jolie in Petco the weekend we arrived back home from the funeral, he fell in love with her immediately and so did I. She helped all of us get through that very difficult time. 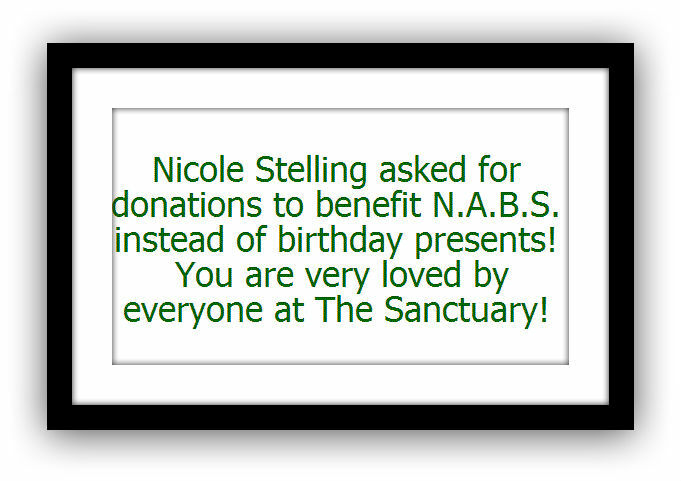 We thank you and all of the contributors and volunteers at N.A.B.S. and so does Jolie. 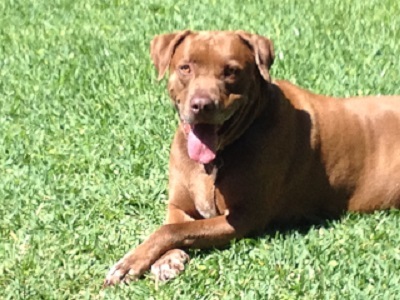 Maddie was adopted by Elaina Mann years back and goes hiking daily on beautiful trails in the hills in California. Isn't she adorable? It is obvious from her relaxed and comfy position on the arm of 'her couch', she is very loved and very spoiled. It was just John and Carlton on the couch, Jolie and I like to sit outside on the patio in the afternoons so she was in her spot enjoying the outdoors. Carlton is so sweet, so far it seems he and Presley have the same temperament. They get along very well. My daughters dog is doing fine with him, too. I can't wait to see all of them playing together and becoming best friends! I am so happy that you emailed me about him. Thank you so much. I will keep you posted on how things are going. ﻿I thought you might like some updated pics of Punkie/Hannah. We are so loving her! 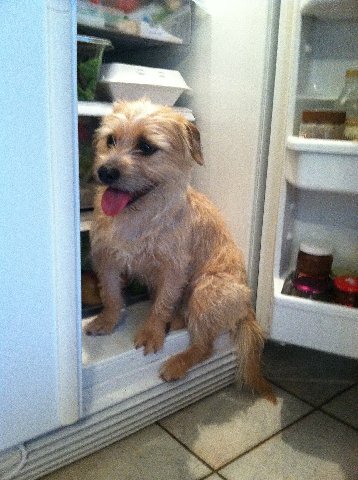 In the first picture, we were having a thunderstorm and she thought the fridge was a good place to hide! 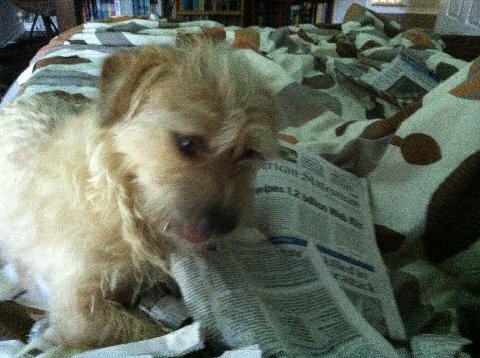 In the second, she decided we had stayed in bed too long and we should get up, so she destroyed the newspaper. I'll send a few more later. She's doing beautifully! 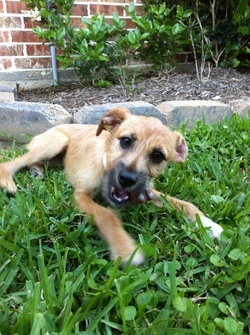 MARCO IS IN A LOVING A HOME! Marco is doing great. He's such a sweet dog and he's bonding with the kids. He's now eating Blue dog food and loving it. I will send more pics later of him with the kids. 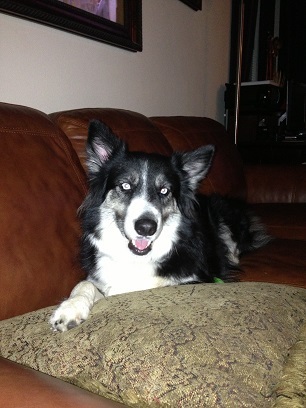 Another of her spoiled life on the couch. She also sleeps up against my head on the pillows in my bed. 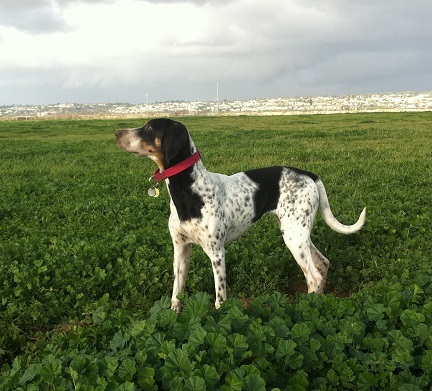 Attached are more photos of Delilah's life - one of her at a fenced in dog park on the ocean. 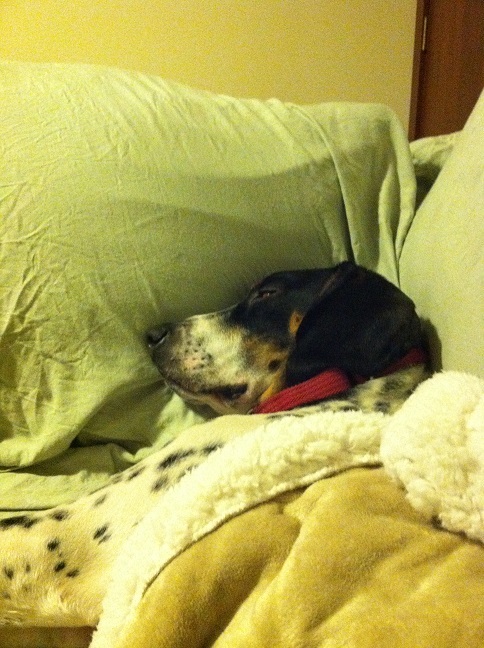 Delilah (Calista) the coonhound pup is one amazing dog. She is the sweetest animal I've ever owned and is gaining a lot of confidence in the world around her. In the near-term, I'll be on the lookout to find her a friend. Love her and thank you again for connecting us! DAX LOOKS LIKE A BEAUTIFUL LITTLE FOX! Stephanie Nichole Simpson says, "I just wanted to say, "Hi!" from me and Max. ﻿﻿I thought you would enjoy this picture. She is so funny!! We think it's hilarious how much she is like a baby - so much so that she likes to be carried around like one! She sits still and waits for Daniel to pick her up when he says, "Are you my baby?" She is so smart! We have taught her sit, lay down, shake, and we are working on stay. She goes to the back door when she needs to go out and scratches the back door when she wants back in. I swear she knows the door knob is how you open the door because she will jump up and put both paws on it like she knows what to do! Everything is working out so well with her. She is a perfect fit for our family. PATRICK HAS FOUND HIS PLACE! Patrick has found his place in our little pack, playing tug of war with Bear (the Lab) and Franklin (the Dachshund) and destroying chew toys! Daddy lets him nap on the big bed, so he's getting spoiled already. Thank you so much for sharing him with us. Here's a picture of the boys, all nice and clean and recently groomed, at the park after a fun long walk. They seem to be adjusting really well. Hi there! Just wanted to share a couple of pictures of ICE! She gets to go on plenty of runs and walks and even found that she can sleep underneath Mom’s bed all night long like a good girl! She watches tv and plays with her sister Charlotte all the time. She is just as happy as can be and I just can’t thank you guys enough for getting her to me! Hope you enjoy the photos. BAXTER IS NOW MOOCHIE! AIN'T HE SWEET? First, Baxter's name is now Moochie. I hadn’t planned to make a change, but he was sitting next to me one day, and it occurred to me that he looked like a Moochie (I was a big fan of Moochie back in the original Mickey Mouse Club days). I told him so, and he has responded to that name from that moment on. He is the young ‘un of the family, and is a mix of exuberant enthusiasm and cowering unconfidence. The latter, fortunately, doesn't happen very often…now it shows up most often when he thinks I’m mad at him. Also, the first time my cleaning lady came to the house after he joined us, he cowered terribly. She is Latina, and I was so sad to see this—a sign of the tough times he had on the street before being rescued. Happily, he loves to welcome her when she comes now and has not shown any fear toward anyone else. He is very intrepid and doesn't back down if Misty, my flat coat retriever who considers herself second in command of our pack, rumbles at him. He teases the cat terribly, but she takes it in good part. One of the heart melting things was his habit of sucking on something when he was going to sleep at night or when he was feeling anxious. I got him his very own fleece blanket, and for weeks he would settle down and suckle it till he fell asleep at night. I’m happy to say that he is using it much less now…the other night I offered it to him and he declined! So it’s a very happy story for this little guy. 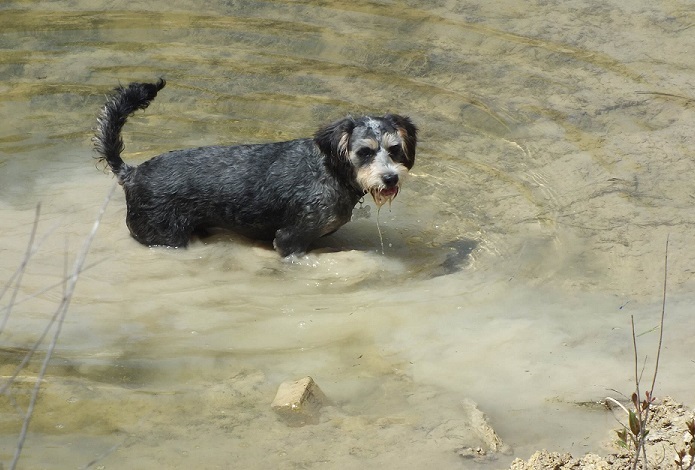 He is my second schnoodle, and I’m in love with this hybrid. He, like Lucky before him, is devoted to me; very smart, full of life, and just a real sweetheart. Thanks so much for what you do! You’ve made another dog and his human very happy! SHE HAD TO SLEEP IT OFF AFTER PLAYING SO HARD. (: Isn't this precious? Byron and Sarah LOVE her! Byron is a Music Professor at UT Austin for 15 years and Sarah is a teacher in Leander. ALI HAS GOT IT MADE! Here are some picture I took of Ali on my new phone. I just got it Sunday. She is doing really good. We love to play with her and go for walks. We all love her! We've gone on one trip and she did great. This is the best thing that happened to me since my mom! 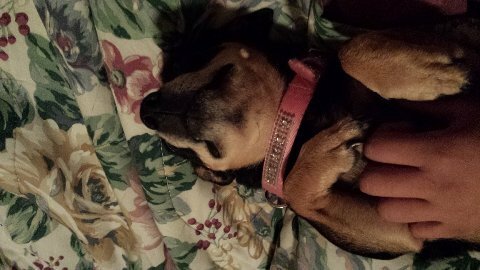 She loves for me to scratch her belly when we get home. May God bless y'all always! I just wanted to update you and send you some pictures of Nero (previously Eikon). He loves his new apartment and life in Georgetown. He goes on walks by the river and around campus with Abby. He loves all the attention from students and other apartment residents. He has a balcony that overlooks the San Gabriel River and loves to lie out and watch people walk by. We hope to bring him by for a visit during the holidays! 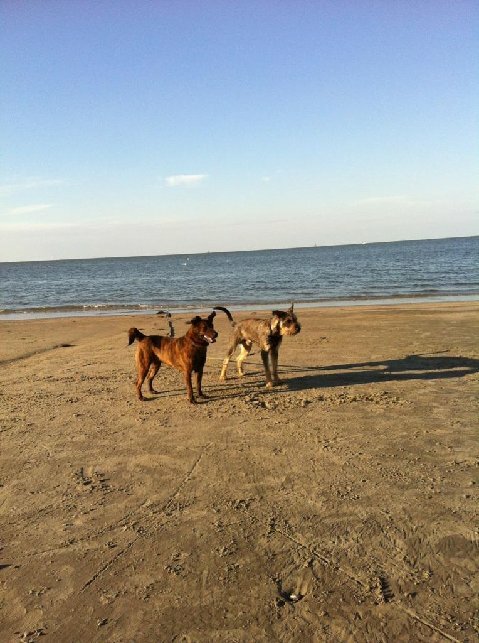 Pam S says, "Thank you Will and Nicole for referring your neighbor and Chucho to N.A.B.S. and I am glad we were able to help him. I am especially thankful to have known Chucho and loved him and been a part of his life too. None of this would have been possible without the N.A.B.S. TEAM!" "Hey! Everything has been perfect! Believe it or not, my husband is CHUCHO's best friend but he loves all of us and we all love him! He is a gift from God! I am going to send you some pictures let me know if you get them and how everything is going!" I am Nichole Beasley. My fiance Karl and I have Foo on our home visit. I'm just letting you know how the home visit is going so far. IT'S GREAT. Foo has adjusted well to living with us, and we couldn't be any happier. 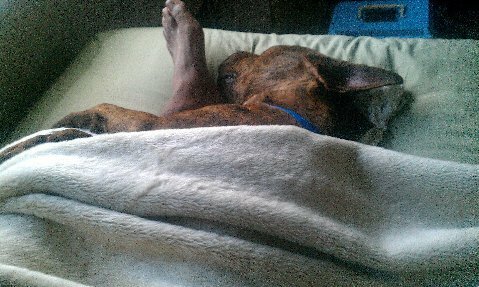 ﻿He is a huge bed hog, so mommy gets the edge while Daddy and Foo take up the rest of the bed, but I honestly wouldn't have it any other way. He loves mommy, but he is definitely a Daddy's boy. Thank you everyone for taking such good care of my baby. We definitely plan on visiting the Sanctuary and other events you guys hold. We also plan on volunteering in any way we can. I just wanted to give you an update on Bella. She is doing wonderful! She is such a good girl. We are enjoying her so much. We are so glad that we found her. Thank you! Penelope aka Miss Piggy, is loving life in her new trim body. She weighs 55 pounds now! Down almost 20 since we got her. She now is very active running, playing with her brother Bagheera aka Big Bit and we just discovered her new talent. She can now jump on the bed with a little effort which is a little over two feet off the ground! It's amazing to see her so full of life and energy when in the beginning we used to have to carry her up and down the stairs. She's the love of my life and I can't imagine life without her. Bagheera is 100% a daddy's boy. 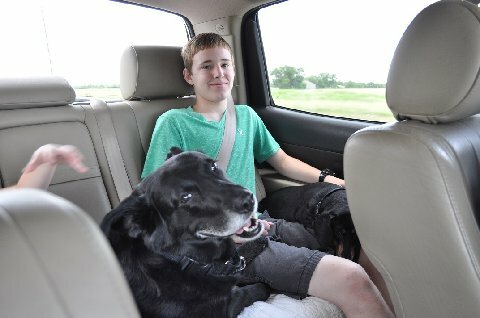 Pretty good for a dog who wouldn't even let Zac pet him when we went to visit at The Sanctuary. He is so sweet and loving and the biggest cuddler. He thinks he's a lap dog even at 80 pounds. But we love him so much we don't mind letting him crush our legs. Bagheera is so great with Penelope and knows just how to "rough house" with her. And by "rough house" I mean he lets her win a lot. Bagheera even adores our pet hedgehog Noah. He will just stare at him forever, wagging his tail at the speed of light. Thank you for all you do for the dogs out there. Without you we wouldn't have these special puppies. What a full and wonderful life he has now ! Doesn't this make all our work and sacrifice worth it? I know it does for me. As soon as I think I can't go any more, I am reminded by these wonderful updates and see everyone's happiness! Then I am able to keep going. Thank you N.A.B.S. TEAM AND JAIME!! 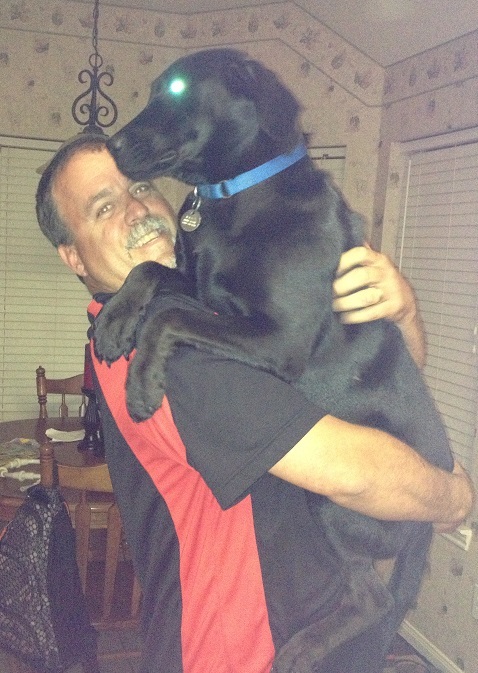 I especially want to thank JEAN for saving him from the gas chamber in Victoria so N.A.B.S. could give him the gift of life and make all this possible! Monty had a blast on our beach vacation. He absolutely LOVED playing in the water. 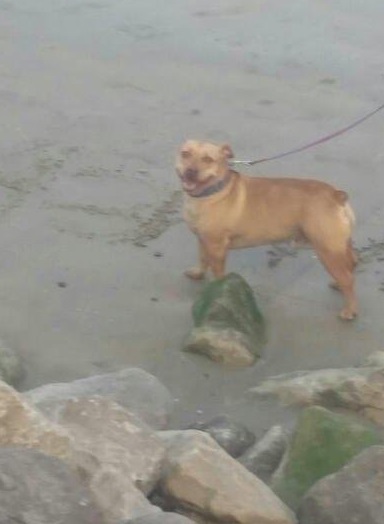 Here's a picture of him on the beach. He played so much, he was exhausted every evening and that doesn't happen very often. You know what a little bundle of energy he is! CHESTER (was Buster) IS CRASHING FROM ALL THE FUN! We are glad to help!! Glad the rescue is saving so many wonderful animals. As you can see Chester is still fitting in very nicely! Emma is still as lively as the day I picked her up! The last time I was at the vet she needed to lose 2 pounds, so I had to cut her food amount. Her eyes are beginning to get a slight haze in them but otherwise you wouldn't know she is 9 years old. She is totally spoiled by all of the neighbors. One neighbor even gets her a bowl of water when we walk in the evening. She was groomed yesterday and looks so cute because you can see those big brown eyes. She apparently will never get used to being groomed because she shakes like a leaf when she hears the motor from the truck and yesterday she wee-wee-ed on me; at least it wasn't the groomer this time. The groomer tickled me. When he set her on the table she was shaking so badly he just stood there leaning against the table and asked her, "What have I ever done to you? I even play music for you!" This is one of my favorite pictures of her. She loved that toy and learned to take the shirt off and to hear it talk. I finally had to throw it away. I thought I was being so clever. I threw it in the garbage can without her seeing me, but I must have hit the button on the hand, and the darn thing said, "Good bye." She looked up like, "What do you think you are doing with my toy?" I had to pull it out of the garbage can until I could take it away at another time. I got her a new one which sings Yankee Doodle. Anyway, thank you for Emma. Apollo comes everywhere with us. We've had him off-leash at two family parties, and he runs around playing with the kids and other dogs outside. He loves to run! I even bought a special waist leash so that he can jog with me. He likes the lake and goes in to cool off, but hasn't taken to actual swimming around, which is fine. He loves to lay on the dock and run back and forth. 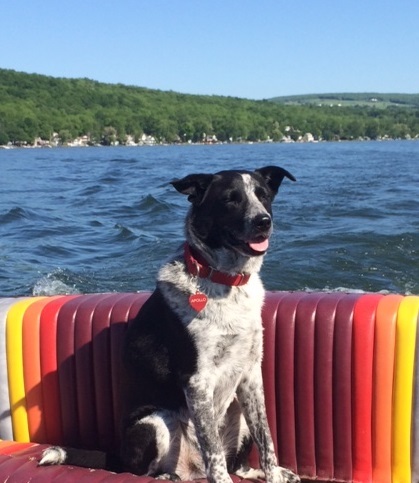 He likes the boat and hasn't been scared at all. It took him a minute to realize he could move around, but now he knows all about boating and will even run downstairs to the back door if we are getting stuff around to go out on the boat. He comes to all of our events and parties. 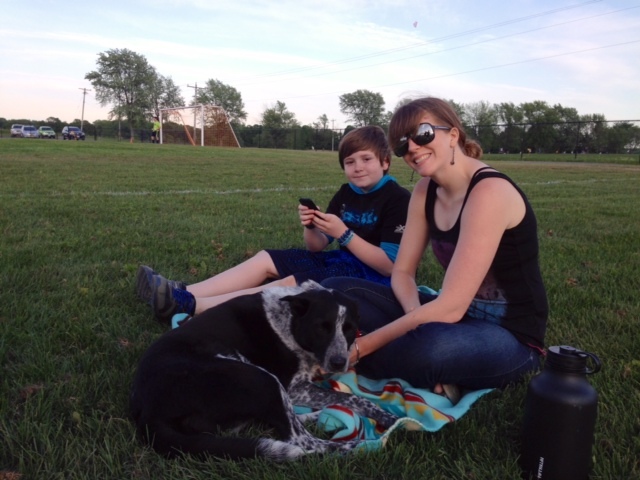 We've taken him to a few festivals and soccer games as well, and he gets so much attention! Everyone thinks he is so unique and beautiful so they run over. We're very happy and Dan calls him "Apollo Prince" because he is very regal. It's really fun to do so many things with him. He has become much more affectionate over time, which I have loved! He is fitting in perfectly and is very special to us. I just wanted to give you an update on Madison ( we call her Maddy). She has been doing so great and we love her so much! I think it took her a while to get used to living in a new place with new people. She was always friendly with us, but after a few months she REALLY took to us and started coming to us for love and attention instead of us going to her for love all the time. We've had her since December and around April we started noticing how she always sat on one side of her hind legs and scoot toward us if we were attempting to pet her. Also she could never climb in our truck, so my husband always had to lift her up. I took her to the vet because I felt maybe she had arthritis or something like that hurting her. The vet said it was possible she has arthritis or a hip dysplasia so she prescribed her a NSAID to treat pain plus inflammation; and also she was scripted a joint support supplement. She said that if it is helping her then she may act like a new dog in a few days, and boy was she! She has really perked up and is getting around so much better. She is such a wonderful dog! Thank you for allowing us to adopt her! First of all HELLO :)... I use to help several years back with adoption days. I know you've had a lot of helpers so you might not remember me. 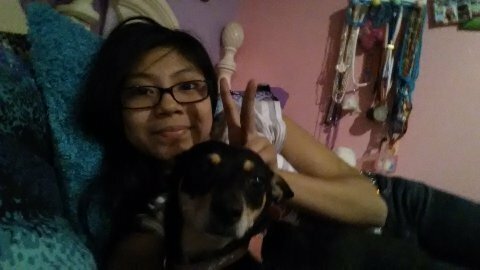 But, I also adopted my girl from you and she's 7 now :)... I can't believe it's been that long already. We are definitely inseparable and we're each others very best friend. I'm so thankful you do what you do, because without you and NABS, and all the volunteers, I wouldn't have her in my life. 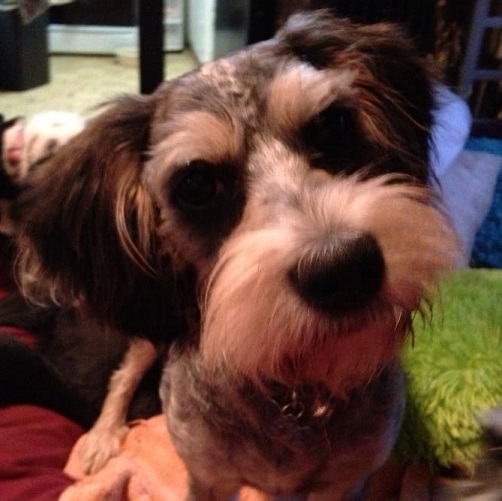 Bindi's mother was rescued from a kill shelter while she was pregnant with her and her 5 brothers and sisters. She was raised for 8 weeks in NABS foster care and then I took her home, where she has spent every day next to me and every night curled up with me in bed. I often think how different my life would have been if you wouldn't have rescued her mother. She's everything to me and I'm so thankful for her. I know this is the type of match you strive to find for your rescue dogs. It has been a match made in Heaven. She's completely healthy, happy, and extremely well mannered. Plus she is the biggest cuddle bug you'll ever meet. She has absolutely made my life ten thousand times better! There are many challenges I've faced and I honestly don't know if I would have ever made it through some of them without her by my side! I really couldn't be more blessed :) THANK YOU FOR HER!!!!!!! I think this is one of the most beautiful pictures I have. stop wondering and give these dogs a chance! Joey is 3 and Mater is over 100 lbs. 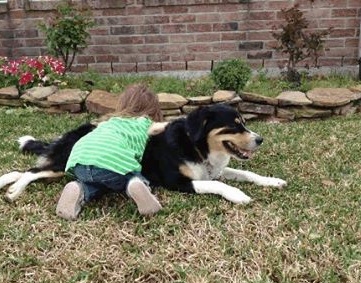 Mater f.k.a Ricky, a Rescue from Noah's Ark Bayou Sanctuary has a heart of GOLD when it comes to the little ones. He loves his Joey; he follows him everywhere he goes and watches out for him. We hit the DOGGIE LOTTERY with this one. Mater is a true family member and I'm certain he will protect and love his little boy always. I'm sure Joey feels the same way about his Mater. (Joey named him after his favorite cartoon character). 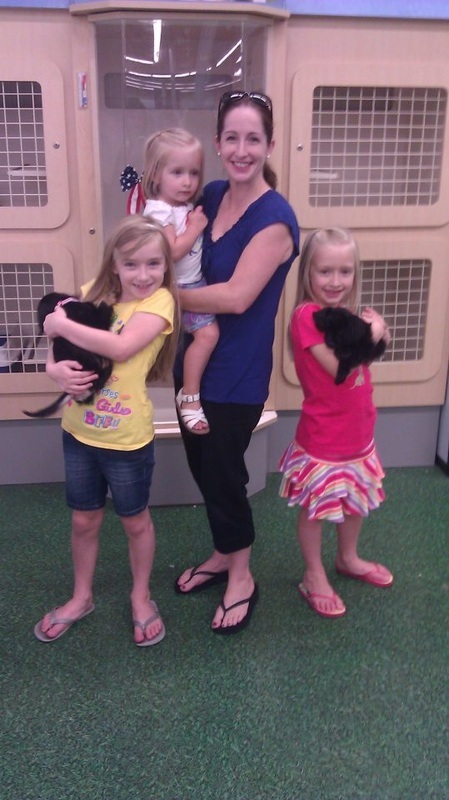 Laverne & Shirley settle in with their new family. They are pictured with Tinkerbell, another N.A.B.S.' rescue. All three of these beautiful babies are now in a fur-ever home. Winchester f.k.a. 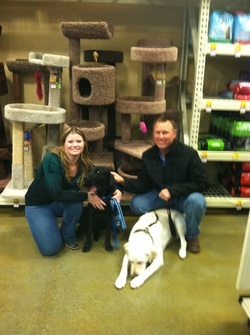 Buster with his new mom, dad, and big brother Remington. 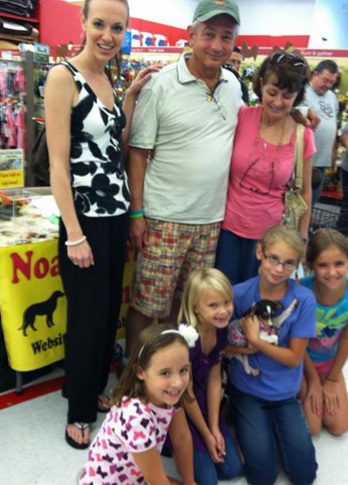 They came to visit at Petco in Alvin, Texas during an adoption event. Thank you Taylor Family! Cheri Grimmett, Gaye Hart's sister-in-law, has been a faithful Co-Sponsor for a number of N.A.B.S.' precious rescues. She has been Douglas' Co-Sponsor. She picked Douglas up to see how he does with her pack and if all goes well then he will be safe and loved in his very own home! Cheri writes, "Everything is going great. He's settling in and making himself at home. Buster is still following him everywhere but he'll stop soon." 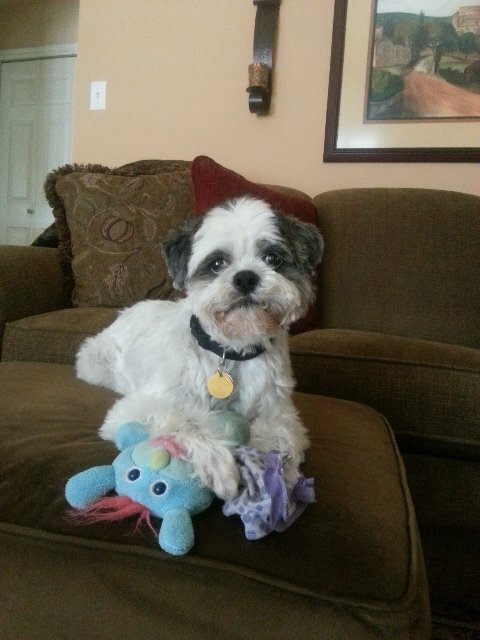 "Douglas is so cute-reminds me of a teddy bear. 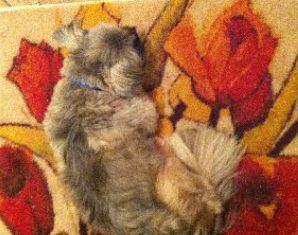 He has claimed this rug as his own. He loves his new bed. It's really soft. He rolled in it and rubbed his face in it-so cute. " 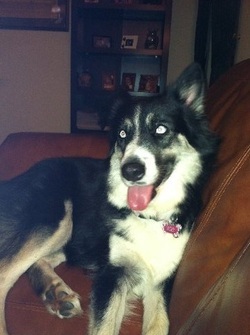 Thanks Harrell family for giving Jasmine, now Kiki a wonderful home! What a precious family photo! 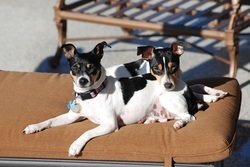 Bonded Pair Lola & Buck Adopted! Brent Stephens. 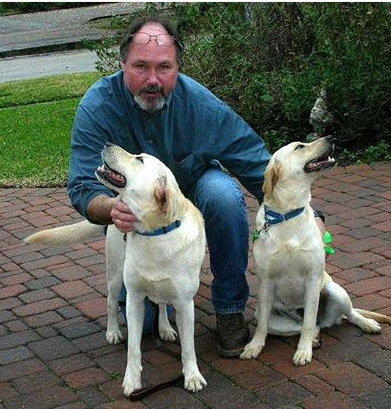 Thanks for adopting the smiling Labs and taking them to your ranch in the Panhandle. 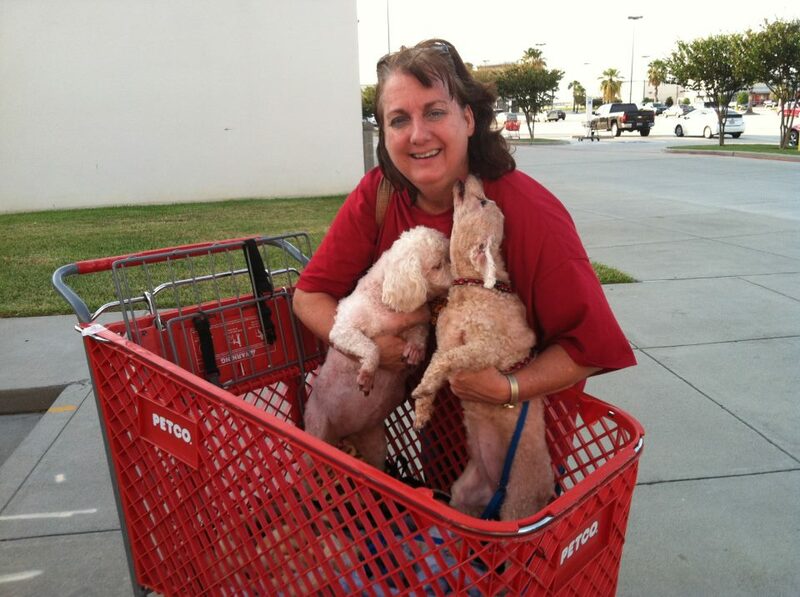 Evonne Honeycutt Adopts Bonded Pair, too! Adopts bonded pair Madison and Didi after fostering them. Maggie and her new little sister. 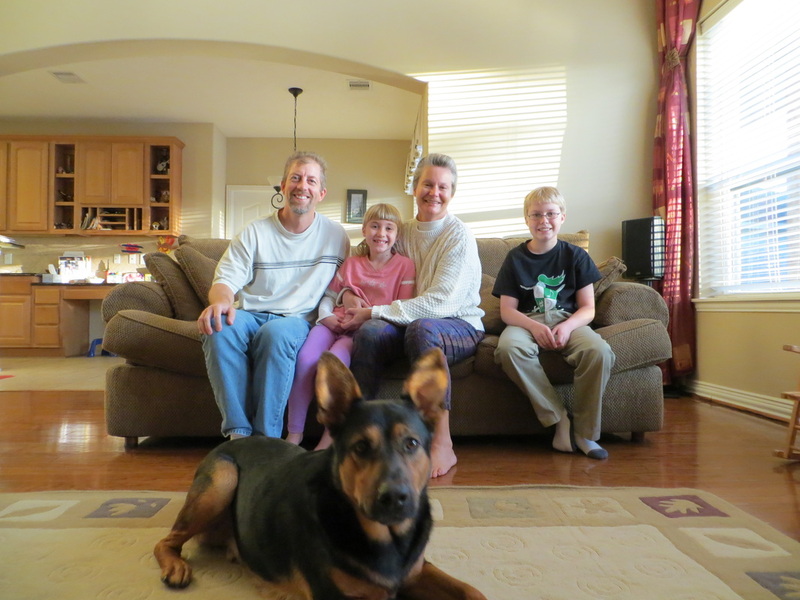 Thanks to the Bauer family who adopted sweet Maggie. Ginger, adopted 8 years ago by Darlene Newkirk. 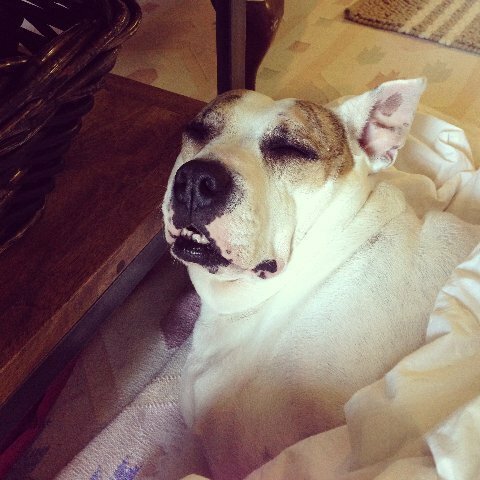 "Liza is still doing great! We love her more and more every day. I can't thank you enough for rescuing her. God bless you, NABS & all the volunteers for bringing so much joy into the lives of those who are lucky enough to adopt a pet from NABS. She is a very special girl," the Thomassee family. She loves her new forever sister, Charlotte. They love to run together and go for walks and play. 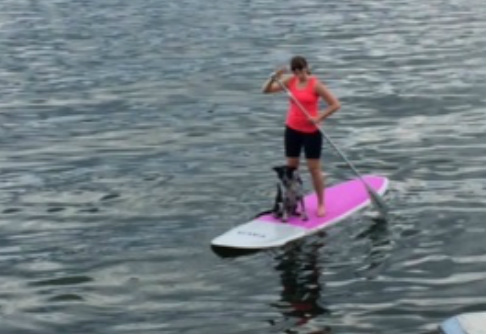 They have taught each other some new tricks! The boys and I love her so much! She has saved my life just as much as we saved hers! Thank you so much! Lady & Tramp Together in Their Forever Home! Shrek is home with Manuella and Allison. 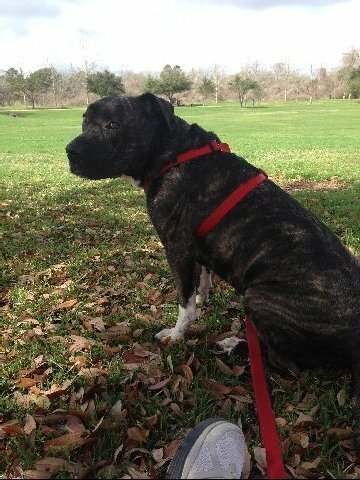 "I wanted to share an update on Otis. Our First Teen Volunteer all Grown Up! "Some days I sit and look at the old pictures and some of the ones you've sent me since and just cry. As much as I hated Texas compared to Tennessee, my happiest moments were spent in N.A.B.S. with you and all those doggies!" Max and I go to bed next to Mommy after a hard day of playing. I get to go to the dog park 3 or 4 times a week, weather permitting. Life is good and I am happy and loved. THANK YOU N.A.B.S., for letting me come and stay here. Dear Mom, thank you so much for sending me with these nice people. I came out of the bath and was super excited I couldn't sit still. Then I got home and had a brand new bed waiting and my own special bag of food. After dinner they had some new toys of my own that I went wild for. (The toys aren't intact any more.) I am very sleepy and tucked myself into my bed on my own with my crate door still open! *Big Bit happily joined 'Miss Piggy' in his new home. Miss Piggy was adopted by Zac's family late last year. 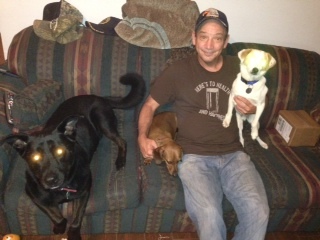 "My Dad always makes room for all of us: the cat, me (Kuzzo )and Kenzi" says Kuzzo pictured above. 5/12 Update: We took Tori to the beach last weekend for the afternoon. She loved it! She loves to go for trips in the car and especially enjoyed barking at the seagulls. She is an awesome dog. She's well mannered and obedient. She is a wonderful addition to our family. Below you can read TORI'S entire story written by Tori's savior, John Lohman of Houston. After a two month search for the best rescue and adoption agency, I found Noah’s Ark Bayou Sanctuary (NABS). I visited N.A.B.S., inspected their facilities, and asked detailed questions regarding their methods, procedures, adoption criteria. Upon leaving, I knew I had found the right temporary home forTori. 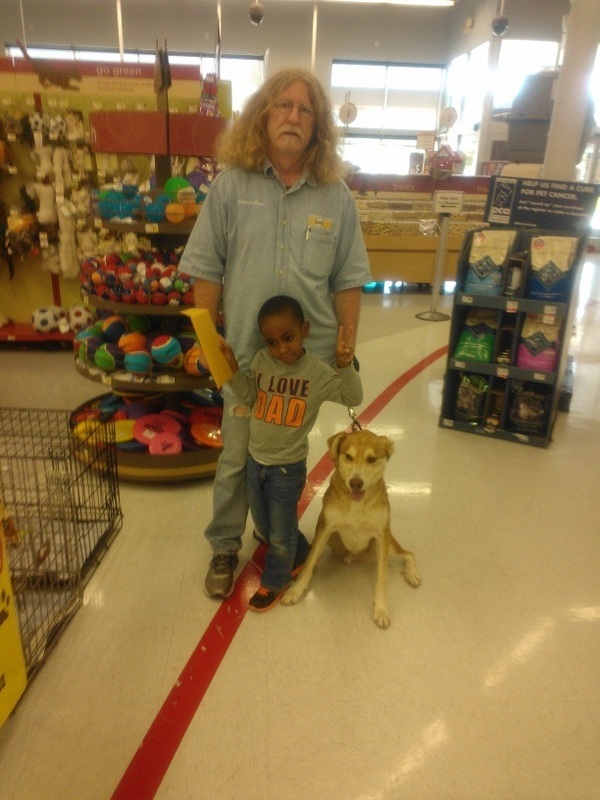 Within a month, Tori had her first to Petco and immediately attracted interest. 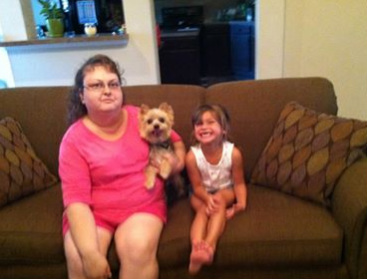 Within three months, she had found a permanent home with a wonderful family. She finally found the home she deserves, all due to the care and hard work on the part of N.A.B.S. 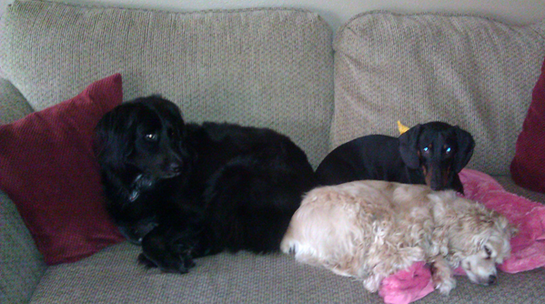 Giselle, Sammy, & Sandy Stelling napping! (left and right) Annie and sibling Troy, both N..A.B.S.' 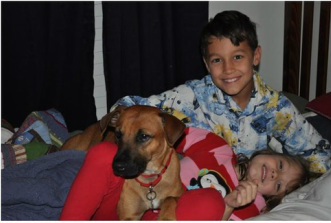 rescues adopted by Terri Fuller and family. 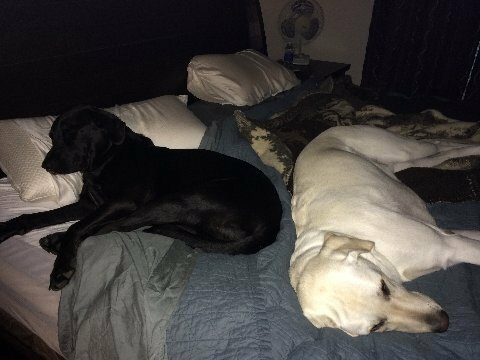 "Bruce (left) could not stay up New Year's Eve so he went to bed early," Lisa Holt-Powers writes. "Thanks for what you do! I wouldn't have my two kids without you guys!" Lauren Luca Youngblood. Liza happy in new home! Liza becomes doggie number 3 in her new home. "She is really sweet with the kids and now sleeps in my son’s room. We are very happy to have her," Jeff & Jessica Smith family. 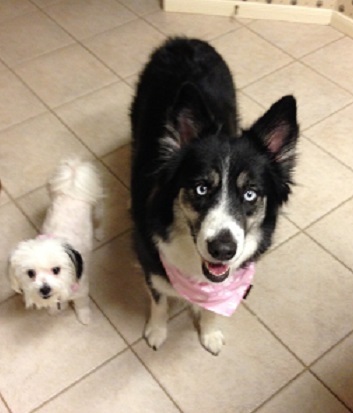 Scarlet has play dates with her new best friend (her new mom's sister's dog). 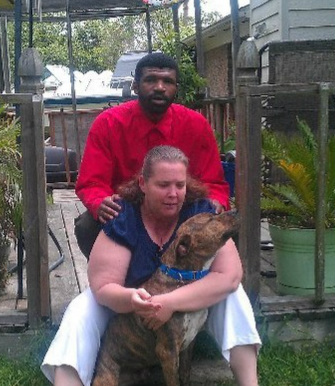 Scarlet ate the loveseat during her home visit, but was adopted anyway. That's true puppy love! Faith loves cuddling with Snickerdoodle. I don't know where to start to thank so many of you who responded to my appeal for a Cart for Ginger. I got at least 75 responses with help of various kinds being offered. I've always heard that Rescue Folk do their best to help--and you sure proved it!!! 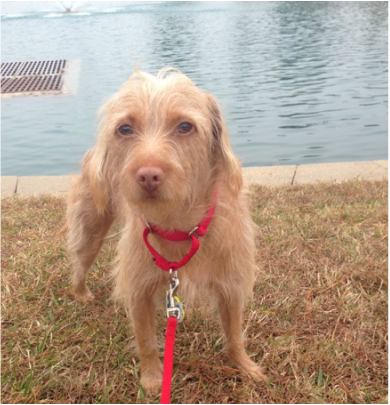 Ginger is now mobile in her doggie wheels from Pam and Gerry with Noah's Ark Bayou Sanctuary, Danbury, TX. I took Ginger down to them when they said they had a cart that would fit, and they worked on adjusting it to fit her perfectly." They have a life now and are sooooo loved!!!! 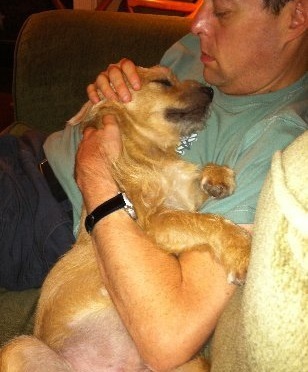 That is Fiona and her Daddy, Bob. Fiona and DJ get to travel and be spoiled!! Mom Sandy knows how to handle them. She watches a lot of Cesar Milan and her confidence lets them relax as they know she is in charge and she has their backs and that is ALL it takes. It took a while for their home to come along BUT God sent along a perfect match!! They ARE their kids! Can you believe it has been 3 years today that my mommy & daddy brought me (Lucy) to my forever home?? This year we both have learned a new way to help with the laundry. When mommy takes the warm sheets out of the dryer we take a nap on them so they will stay warm!! 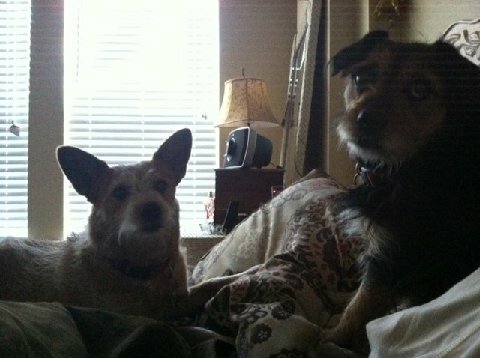 One more thing, Daddy says when we get moved and settled he might let us adopt a new sister!! I hear my parents talking about a lab or golden retriever, I am not sure what that is but I love all fellow 4 legged friends!! So it has been a busy year, but I wanted to make sure you got my annual email & thanks again for being so wonderful!! Sasha, was getting lonely and a little destructive, since the kids went back to school, so we decided it was time for her to gain a lifetime companion. I had been looking online and as a family we had been going to the shelters. We saw many dogs that would fill the void, but somehow always came back to the fact we wanted another German Shepherd. 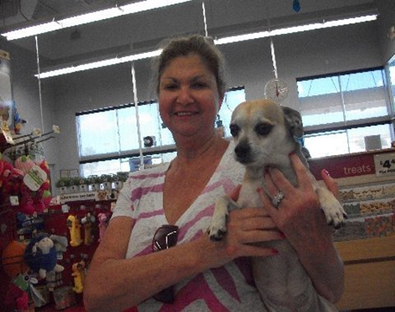 On the way home from shopping, we stopped at a Petco to pick up scoobie snacks and it was pet adoption day. We strolled over to take a look. One of the ladies asked if we had a preference. I answered, "Yes. 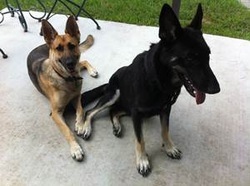 I want a German Shepherd." She said okay and started flipping through her book of adoptable pets. I then said, "But I want a black one." She kept flipping. I then said, "And it needs to be a female." Still flipping! 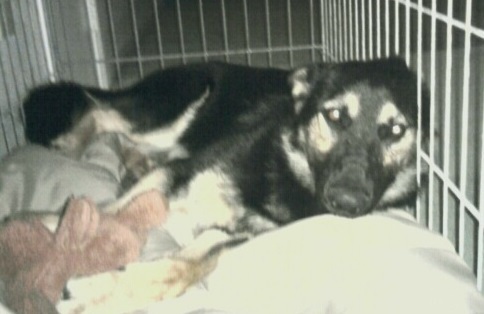 She then came to a picture of a beautiful, black, female, GSD. Our eyes lit up. I had to know more about her. The nice lady called to verify she was still available and she was. But she told me she was way out in the country down in Liverpool. I coudn't believe our luck that day! I live just around the corner from Liverpool!!! so she took her home and waited. 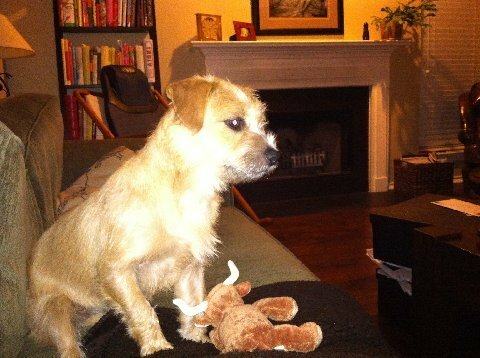 Obviously, Pam was waiting for our call and we believe it was meant for us to adopt Adelle. After just missing her at the pound, then her being at a rescue just around the corner from our house, and her being exactly what we were wishing and praying for, makes it all clear. She was destined to be the newest member of our family. Adelle and Sasha now play together all day and share the couch every night. We now sleep even better knowing the girls are there to protect us. We have watched them grow closer and closer since bringing her home and I'm certain this is what was meant to be. Thank you Pam, for rescuing our baby. You are a wonderful human being for doing what you do!! God bless you.